The Department of History and Archaeology, Nagaland University, invites junior and senior scientist to discuss matters of monumentality from different viewpoints: The international PhD Seminar “Building Big? Global Scales of Monumentality – an ethnoarchaeological perspective” and following workshop “Hierarchy and Balance: the role of monumentality in European and North-East Indian Landscapes” taking place at the Kohima Campus (Meriema) in Nagaland from 12-24 March. It is jointly organised by the Nordic School of Archaeology “Dialogues with the Past” (Department of Archaeology, Conservation and History, University of Oslo, Norway) as well as the CRC 1266 and the Graduate School “Human Development in Landscapes” (GS HDL) at Kiel University. What does monumentality mean in different societies? How could a comparative approach be useful to answer archaeological questions on reconstructing social behaviour? Is it possible to connect the very different theoretical approaches on monumentality? How much are especially theories focussing on the organisation of labour and cooperation influenced by western-capitalist views on economy and labour organisation? How can a comparative approach that includes ethno archaeology be useful for studies on monumentality? Where can similarities and dissimilarities be found in broad studies on this topic? In the following days, the workshop lectures given by Christian Jeunesse (University of Strasbourg), Tilok Thakuria (North-Eastern Hill University, Tura campus, Meghalaya), Luc Laporte (University of Rennes), Marco Mitri (UCC, Shillong), Colin Richards (Orkney College. University of Highlands & Islands) and Johannes Mueller (University of Kiel) provide comparative perspectives on different forms and aspects of monumentality. 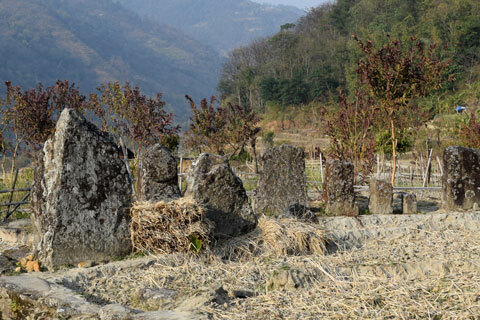 In the context of surrounding monumental architecture of the Nagaland region and expertise of participating specialists from Northeast India, both events draw special attention to the “Naga Megaliths” as one connecting facet of the daily experience – to be explored vividly in the following excursions. As one main organisers and supporters of the events, PhD candidate Maria Wunderlich and CRC 1266 and GSHDL speaker Johannes Müller bring in long-term experience in research on prehistoric monumentality in Europe gained during the DFG Priority Programme 1400 “Early monumentality and Social Differentiation”, from which the collaboration with the Nordic School of Archaeology and the Indian scholars grew. Müller looks forward to his stay in India: “It’s a new practice to bringing together European and Indian student tandems for presentations on one topic and also to organise the workshop along structural comparisons of Northeast-Indian and European transformations. As a whole, this is a forward-looking format for international academic communication and graduate education on equal terms”. For our associated PhD Johanna Brinkmann, the workshop is an important occasion to get ethnoarchaeological insights in rituals and practices of monumental stone architecture, which makes an important contribution to her PhD thesis “Theories on Neolithic Monumentality. Our guest PhD Mariana Vasilache-Curoșu is also participating in the workshop.